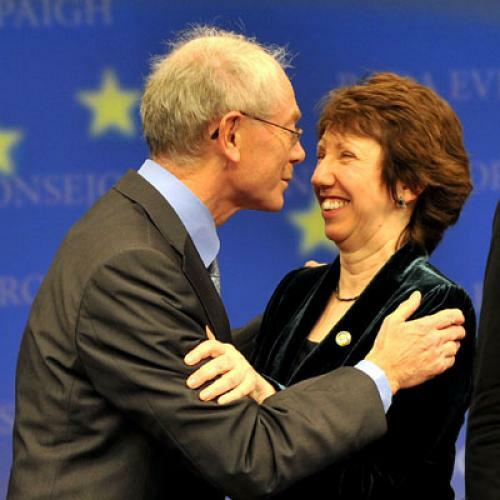 Today the European Union finds itself with two new top leaders--Herman Van Rompuy, the EU’s first president, and Catherine Ashton, the new high representative of foreign policy. If the names are unfamiliar, you’re not alone. In fact, the buzz surrounding Van Rompuy, who has been the Belgian prime minister for less than a year, and Ashton, who was most recently the EU’s trade commissioner, is that there is no buzz. Nevertheless, the Christian Democrat, who is a classicist and economist by education, is known as the country’s “Mr. Fixit” for his ability to reach compromises. Before his PM gig, he was a mainstay in the Christian Democrat party, and over his many years as a low-profile politician, he does seem to have drummed up immense support in his own country. He will, however, have to win over the support of some of the British, who reportedly refer to him as “Rumpypumpy” and heavily pushed their former PM Tony Blair for the position. Ashton, who is a member of the Labour party and also an economist by training, has no evident foreign policy experience, outside of her past year at the EU where she is best known for a free-trade agreement with South Korea and high level trade talks with China. She also had a role in the Lisbon Treaty negotiations that created the new presidential position. So, will Van Rompuy and Aston bring to the table the weight necessary to deal with leaders like Barack Obama, Hu Jintao, and Vladimir Putin? Who knows? But they certainly won’t suffer from inflated expectations.